לחצו על Set Alert, בתחתית התיבה הימינית והרשמו לשירות. לחצו על Create Citation Alert,בראש התיבה הימינית והרשמו לשירות. 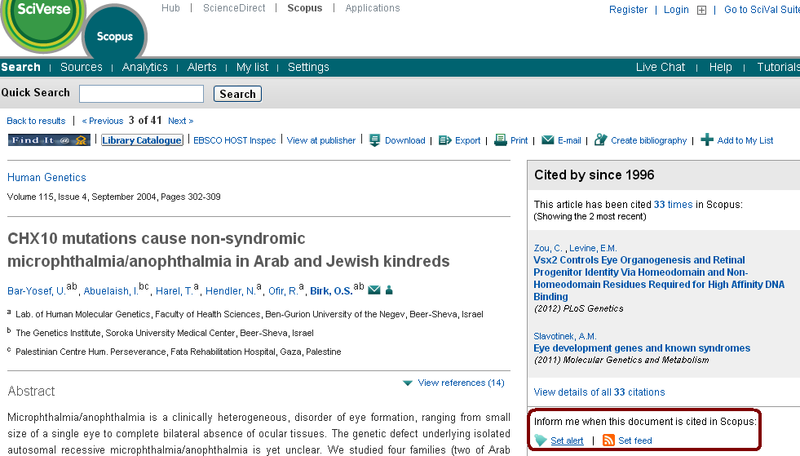 בשונה משני הנ"ל Google Scholar Metrics מאפשר התעדכנות בפרופיל פרסומים של מחבר ולא רק במאמר בודד. עם הכניסה או לאחר חיפוש ב -Scholar לחצו על כפתור My Citations. הגדירו את שמכם לחיפוש עתידי, והרשמו לשירות. מעוניינים לקבל עדכונים שוטפים על ציטוטים של העבודה שלכם? במדריך זה מס' דרכים לעשות זאת, בצורה המסורתית ע"י ניתוח ציטוטים, ובצורה החדשה של עדכונים ברשת החברתית. כמו כן, טיפים כלליים להגדלת היקף החשיפה של מאמרכם לקהלים רבים יותר, ניתן למצוא כאן. The Altmetric Explorer is a powerful web app that allows you to track the conversations around scientific articles online. Altmetric collects and analyzes hundreds of thousands of postings about tens of thousands of articles and datasets each month. altmetrics is the creation and study of new metrics based on the Social Web for analyzing, and informing scholarship. Tell the full story of your research impact. PLOS Article-Level Metrics (ALMs): measuring the impact of research. ALMs provide a suite of established metrics that measure the overall performance and reach of published research articles. The idea of using the social web—social bookmarks, tweets, Facebook "likes", Wikipedia references, etc.—to track the post-publication discussion around journal articles and other scholarly content is of course older, but in 2010 both the term altmetrics was coined and a widely-read manifesto published. Since then, we have seen a flurry of activity around altmetrics, including numerous articles and blog posts, and three conferences. Altmetrics have grown up, and the articles on altmetricsin this issue of ISQ reflect this shift in the discussion.